Indulge your patrons with the rich, creamy flavor of pumpkin pie filling blended into their coffees and specialty drinks with this Torani 64 oz. pumpkin pie flavoring sauce! Crafted with hints of cinnamon, nutmeg, and ginger, this flavorful sauce embodies the spirit of autumn and the warmth of holiday cheer. It is packaged in a large, user-friendly 64 oz. bottle so you can enhance your seasonal drink menu with a variety of popular drinks, including pumpkin pie lattes, pumpkin cheesecake shakes, pumpkin sparkling ciders, and iced pumpkin spice white mochas. Featuring a thicker consistency than liquid flavoring syrup, this flavoring sauce is great for swirling atop whipped cream or blending into sweet frappes. It adds just the right amount of fall flavor and spice to any cup of freshly-brewed coffee. Torani pumpkin pie flavoring sauce can even be used in baked goods and desserts, including pumpkin spice bread and pumpkin pie creme brulee! Pretty good. Had a long debate with whether this was a syrup or a sauce. Looked a little watery but after shaking seemed better. Definitely a staple for pumpkin spice lattes! This is a great sauce and is way better than the syrup. I would say that for this product less is more. It can be a little too sweet. This pumpkin pie sauce is the best out of all the brands we tried. It is not too spicy and the pumpkin actually comes through in the drink really well. This sauce is great for the ever poplular Pumpkin Spice Latte! We have used it for years and will be coming back for more next fall I am sure. Great product! This is the best pumpkin flavored sauce that we could find - it is just so yummy. My team did a taste test of different sauces for our pumpkin lattes, and this one came out on top by a big margin. Customers have given us great feedback on this product, too. We love this sauce for coffee drinks as well as drizzle on cupcakes and other desserts. It adds the perfect amount of pumpkin spice every time! Wonderful flavor it tastes just like pumpkin pie. Can be made either hot or cold. One of our most popular flavors for the fall season. A really great style pumpkin pie flavoring sauce that is a great staple for making our fall themed desserts. The sauce is very delicious and has a nice spice flavor to it. Excellent in lattes. The Torani pumpkin pie flavoring sauce is the best dessert sauce ever. A great flavoring for drizzling over pie or cheesecake and really good over vanilla ice cream. Pumpkin flavor is a must for the colder months, and we just love this Torani sauce for our on-site cafe'! We will definitely purchase again! A great seasonal sauce that is very flavorful and taste just like pumpkin pie. A great sauce for garnishing cheesecake and adding to our lattes. We ordered this to begin with for our fall drinks but our customers liked it so much it is now one that we keep around all year. At our Coffee Shop we love this pumpkin pie syrup! We have used it for 2 years now and our customers really enjoy it. It has great flavor! Everyone loves pumpkin pie around fall. It would be a mistake if you did not carry this sauce for your dessert bar. This stuff is absolutely delicious. This pumpkin pie flavoring sauce is a hit in the fall season, however, customers love the flavor so much they ask for it all year! love that we can purchase this in a bulk bottle to refill our smaller bottle with. makes it so much easier then having to reorder all the time. The pumpkin flavoring is an absolute hit for the fall. One of my all time favorites, obviously during the fall and winter season it’s unbeatable. TASTES AMAZING!!! Great size, works well with a pump for portioned servings, no dripping or leaking with pump noted. Overall a great toppings to add on our toppings bar! My favorite time of year especially because we get to sell the pumpkin pie flavor! This flavor is really popular with our cinnamon or toasted marshmallow flavors! we love this !!! perfect to make a pumpkin spice latte. the flavor is good. i recommend this product if you are looking for pumpkin sauce to make a pumpkin spice latte!! This makes the best pumpkin spice lattes! This is a must for our coffee shop around the holidays. It holds up Well to hear and blends well too. Customers go absolutely insane for Pumpkin Spice in the fall. I sold out of one bottle in less than a day once. I probably went through 20 bottles or so the entire season, and we are generally not a very busy shop. I used it to make lattes as well as pumpkin pie shakes. Love Love Love this sauce! I used it to make pumpkin pie hot chocolate and it tasted so natural and not crazy sweet. Customers loved it. I used to only be able to,purchase thus sauce seasonally in a small bottle around Thanksgiving u til I found these large bottles online through the Webstaurant store. Now I can enjoy pumpkin spiced lattes year round. The cost is a fraction of what I pay at the market during thanksgiving. So happy to have found this product for my hone coffee bar. Order the pump to go with it and it makes it a breeze to create delicious lattes at home hot or iced. The Pumpkin Pie Sauce from Torani is wonderful. Our customers love it so much, we've turned many of them away from the large coffee chain. It is so much more flavorful than other sauces we tried. Amazing pumpkin pie flavoring and great taste. Just a little splash in your coffee or on your favorite desert will bring a smile. Great price offered. This was a given for fall. We like that it isn't just pumpkin spices, but actually have a pumpkin flavor. The name is very accurate and it's a hit. Pretty authentic creamy pumpkin spice taste. Was worried it would taste really artificial, but I'd buy this again in a heartbeat! For this larger size, I suggest buying a pump top for it. This is the larger version of the smaller bottles already on hand. I definitely recommend the use of a pump to help facilitate use. Without a pump, it is hard to use all of the product. This is a great find, not just for autumn, but any time of the year. Great over many different ice cream falcors but also drizzled over pies, especially apple. This flavoring sauce is great. It actually has spices in it unlike the other brands which only have artificial flavoring. Be sure and get a matching pump to go with it. Pumpkin Spice is a Fall hit and this larger size is more convenient than the smaller size "16.5 oz" which is actually only 11 ounces. You can not go wrong with pumpkin pie flavored coffee in the fall!! 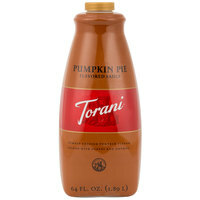 Torani Pumpkin Pie flavoring is an absolute must have!!! Our customers rave about the amazing flavor of our pumpkin pie inspired coffee drinks! This is the perfect Fall flavor. We use it in lattes, frozen frappes, and even milkshakes. It just cannot be beat in regards to flavor and keeps the customers coming back. A perfect year around sauce for coffee and decadent desserts. Torani's Pumpkin Pie sauce has a true and authentic taste of a pumpkin pie. Thank you WEBstaurant Store for the best service! This is the best Pumpkin flavoring for a simple Pumpkin Pie latte or frozen treat. Many of our customers did not like the "Pumpkin Spice" variety of most syrup manufacturers, so it was great to find a sauce with just the smooth creamy pumpkin pie flavor and not overwhelmingly cinnamon or spice notes. Love this stuff. My customers love it and It makes great hot chocolates, mochas and even frappes. Love the price as well because it is cheaper than other places!